Keeping New York City clean is anything but easy, but we at Janitorial Cleaning Services New York LLC are passionate about the task. With our superior cleaning services, commercial companies will never need to look for another commercial cleaning service. Janitorial Cleaning Services New York LLC provides commercial building cleaning for all types of establishments. We are a commercial cleaning business adamantly committed to providing only the best commercial building cleaning services and customer service. If your establishment needs commercial cleaning, New York has nothing better to offer than Janitorial Cleaning Services New York LLC Inc. 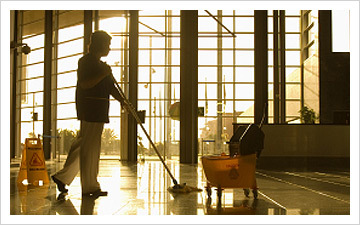 Some professional commercial cleaning services will only offer a daily cleaning services option. However, here at Janitorial Cleaning Services New York LLC, we understand that you may not need commercial building cleaning every day. To offer the most convenience possible, we offer flexible cleaning schedules. With our flexible cleaning service, commercial companies can choose the cleaning options that are best suited to their needs. Do you have one or more offices in need of commercial office cleaning services? If so, Janitorial Cleaning Services New York LLC can help you keep the workplace clean, safe, and productive for your employees. We offer commercial office cleaning services that can be customized to meet your needs. Options include bathroom maintenance, interior window washing, vacuuming, mopping, and trash pickup. With this expansive array of available cleaning services, commercial businesses will never have to mop their own floors again! Don’t just search “commercial cleaning, New York” and choose the first company that pops up. Choose a commercial cleaning service you can trust to get the job done right every time. No matter what your purpose, your commercial building needs to be safe and sanitary. Janitorial Cleaning Services New York LLC can help you maintain a clean environment for your workers. Hiring a professional commercial cleaning company allows you to focus on the important work your company does on a daily basis without worrying about the mundane task of sanitation. Let our commercial cleaning business do the dirty work for you! Janitorial Cleaning Services New York LLC offers a flexible cleaning service commercial organizations don’t need to work around. We know that the city never sleeps, so we will customize our cleaning schedule to fit your work. Our commercial cleaning business won’t stop you from getting your work done. In fact, with professional commercial cleaning, you will be able to do your work even better! No more worrying about the carpets or taking out the trash. Simply call us and enjoy the best commercial cleaning New York has to offer! Not all commercial cleaning, New York companies are created equal. A professional commercial cleaning company should provide high quality services during each and every visit. With Janitorial Cleaning Services New York LLC, you won’t have to worry about the quality of your cleaning. Our employees complete every task with care to ensure that you receive the best results. With our cleaning services, commercial customers can expect to work in a safe and sanitary environment every day. Deciding whether to use a professional cleaning service is difficult. You may be thinking “why can’t I just clean the building myself?” While it’s true that you could, the question is whether or not you should. Your main function as a commercial business is not to clean the office. Cleaning is not the best of your time or the time of your employees. You may have to pay a little bit of money for a professional cleaning service, but think of the money your employees will earn by spending more of their time working and less time cleaning! Why should you bother with cleaning the floors and taking out the trash when the professional can do it all for you. Let us do what we do best so you can focus on the things you do best. Contact Janitorial Cleaning Services New York LLC today to learn more about what we can do for your commercial business. We promise you will be more than satisfied with what we have to offer.